A faulty heating unit malfunctioned and instead of heating the home, it covered it in soot. This soot spread everywhere and left quite a serious mess. Since the soot that was blown out was charged it was able to pass through cabinet drawers and closet doors. It essentially covered everything in the home. Because the soot is oil based it would have been impossible for the home owners to clean out on their own with the tools available to them. They contacted us for help. Cityline was hired to perform emergency services on the double wide. 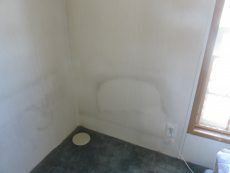 We brought in our team of cleaning experts to clean the property without leaving a smudge or trace. We also wanted to make sure that there was no lingering smell of smoke or toxins in the building as well. This was especially important since one of the dogs would only sleep on his bed, and we wanted to make sure he would be able to sleep there without smelling like smoke in the morning! The extent of the damage required a total cleaning of the entire home. We first cleaned off the items that were in the home with scrupulous detail. One tricky thing about this home was the abundance of collectibles and ceramics that need extra attention upon cleaning. Moving these items out of the way allowed us to access the rest of the home without any issues. Our team of cleaning experts got started on the entire house, making sure to not leave any spot unchecked. Since the soot had gotten onto moisture sensitive objects as well (Books, lampshades ect…) we had to take extra care to make sure that we did not damage the integrity of the item. We are happy to report that we were able to recover all the books affected along with all of the clothing. We had to use a deep cleaning sponge and cleaner on some of the furniture while softer furniture and upholstery were treated with the much more gentle shampoo, including the dog bed, but we were able to get them clean and scent-free as well. Our team handled these items like the pros they are and got each one spotless without damaging the integrity of any collectible. The other important thing we do with all puff backs is purify the air to get rid of any and all toxins left in the air and the woodwork. With the use of our purification machines we are able to remove any residual the toxins from the air and extracted all of it from the woodwork. This in turn removed the odor of smoke from the home, leaving it with a much more welcoming smell. It was determined that replacing the carpeting with fresh clean carpet would be the best option for the home. The home owner worked with our team to choose a new carpet that went with the rest of the home and was to their liking. We also replaced the furnace with a new, more efficient, one to help prevent any future puff backs. This new furnace is also more energy efficient than the old furnace and will help the home owners keep a lower electric bill during the winter months. Once we deemed the house ready to go we brought back in the possessions of the home owners and put them back where we found them. This includes setting up the collectibles in their order. We removed our equipment and left this home with a happy ending for the home owner.